Earn $100 Cash Back after you spend $500 or more in new, net purchases in your first three months from credit card account opening. 0% Introductory APR on credit card purchases and balance transfers for the first 12 months from Account opening. After that, a variable APR of 13.99%, 17.99% or 23.99%, will apply. Earn unlimited Rewards Program Points with every purchase that never expire and redeem for cash back, popular gift cards, merchandise, or flights on most major airlines. From running errands to taking vacations, the HSBC Platinum Mastercard® with Rewards credit cardHSBC Platinum Mastercard® with Rewards credit card can help make all of your purchases more rewarding and more secure. Thanks to HSBC's great fraud protection and purchase assurance, price protection, travel assistance and roadside assistance services, you'll enjoy added security and convenience benefits at no additional cost when using your HSBC Platinum Mastercard® with Rewards credit cardHSBC Platinum Mastercard® with Rewards credit card. $100 cash back for new cardholders who spend $500 or more during the first three months from account opening. 0 percent introductory APR on purchases and balance transfers for the first 12 months. Travel and roadside assistance services. One point per $1 spent on all purchases. Enjoy a simple reward structure of one point per $1 spent on all your purchases with no caps or expiration to worry about. Rest easy with excellent travel and purchase protections, including extended warranty coverage and price protection. Take advantage of 12 months no interest on purchases and balance transfers. This card is more about protections and features than rewards. If you are mostly interested in rewards earning, you'll probably want to look at other rewards cards with higher earning rates, such as the Citi® Double Cash Card - 18 month BT offer. This is a simple-to-use rewards card that won't burden you with a ton of fees. Earn one point per $1 spent on every purchase with no caps or expiration on your earnings. Additionally, the HSBC Platinum Mastercard® with Rewards credit cardHSBC Platinum Mastercard® with Rewards credit card offers 12 months of no interest on purchases and balance transfers, which could save you a significant amount of money if you have a purchase to make and need a few extra months to pay it off (there is a balance transfer fee to consider, by the way). Beyond the rewards, this card comes loaded with features. Feeling secure when making a credit card purchase is important, and HSBC does right by customers with its excellent fraud, travel and shopping protection services. To start, not only does the HSBC Platinum Mastercard® with Rewards credit cardHSBC Platinum Mastercard® with Rewards credit card feature an embedded security chip which provides enhanced protection when used at chip-enabled terminals (which have become the norm), but if your identity is compromised, you won't be held responsible for unauthorized use and you'll receive one-on-one support until your claim is resolved. That one-on-one support feature is a big deal. Having your identity compromised is a disconcerting and violating headache; knowing you have a dedicated person on your side is a comforting feature. This peace of mind is especially important while traveling, and thanks to the HSBC Platinum Mastercard® with Rewards credit cardHSBC Platinum Mastercard® with Rewards credit card's many valuable travel benefits, cardholders can spend more time enjoying their purchases instead of worrying about them. From pre-trip planning services to MasterRental® Insurance which provides up to $50,000 of collision, damage, or theft coverage on qualified rental vehicles; to Travel Accident Insurance which provides up to $1 million in coverage for you, your spouse or domestic partner, and your dependent children when traveling on a common carrier; to Master RoadAssist® Roadside Services, which sends someone to the rescue if your car breaks down while traveling within the United States, HSBC has really thought of it all when it comes to protecting cardholders while they travel. Lastly, the HSBC Platinum Mastercard® with Rewards credit cardHSBC Platinum Mastercard® with Rewards credit card offers a number of shopping services that have caught our attention, including Purchase Assurance®, which covers most purchases up to $1,000 against accidental damage or theft for 90 days from the date of purchase; Extended Warranty, which doubles your original warranty for up to one year; and Price Protection, which can refund the price difference on a purchased item when you see it advertised for less within 60 days. 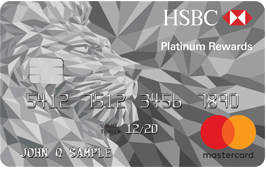 If you're looking for a card that will gain you a lot of rewards quickly, the HSBC Platinum Mastercard® with Rewards credit cardHSBC Platinum Mastercard® with Rewards credit card might not be the best card for you. Though purchases made with the card will earn you one point per $1 spent and can be redeemed for cash back, gift cards, merchandise and travel, the point earning potential is lower than some other flat-rate cash-back credit cards. If you're primary reason for getting a new credit card is to earn rewards, you can likely find another card with higher earning and a similar lack of fees. That said, the suite of other perks and features with this card is substantial, so don't automatically discount it if those other features matter to you a great deal. Similar to the HSBC Platinum Mastercard® with Rewards credit card, Chase Freedom Unlimited® is a no-annual-fee card that offers a 0 percent introductory APR for the first 15 months (then, 17.24% - 25.99% variable), and purchase protection, extended warranty, and auto rental collision plans; however, it offers a few unique features that the HSBC card does not. For starters, with Chase Freedom Unlimited®, you'll earn 3% cash back on up to $20,000 spent during your first year as a cardholder and then 1.5% on all your purchases after that. Maxing out that initial earning rate alone could earn you $600 in cash back and that's before your 1.5% even kicks in. The rewards offered with Chase Freedom Unlimited® card are nice, but the travel and shopping protection services aren't quite as extensive as with the HSBC Platinum Mastercard® with Rewards credit card, and Chase Freedom Unlimited® charges foreign transaction fees, which is important to remember for anyone who plans to use their card internationally. The most notable feature of the HSBC Platinum Mastercard® with Rewards credit card is the rewards (Citi is a CardRatings advertiser). This no-annual-fee card offers cash back twice on every purchase with 1 percent cash back when you make a purchase, plus another 1 percent cash back when you pay those purchases off. This is a stellar reward rate for those who are good about paying off their credit card balance each month (and, frankly, no amount of rewards is ever going to offset ongoing interest charges if you don't pay off your card each cycle); however, the bonus rewards stop there. There's no signup bonus with the Citi® Double Cash Card - 18 month BT offer and it also doesn't offer notable travel or shopping protection services like with the HSBC Platinum Mastercard® with Rewards credit card. There are also foreign transaction fees charged when the Citi® Double Cash Card - 18 month BT offer is used internationally, which again is a big thing to note for frequent international travelers. Again, the Bank of America® Cash Rewards credit card is another no-annual-fee, cash-back card that focuses a lot on rewards and bonuses, but not so much on other valuable features like the shopping and travel protection benefits and services offered with the HSBC Platinum Mastercard® with Rewards credit card. With the Bank of America® Cash Rewards credit card, users can take advantage of a new offer: Maximize cash back in the category of your choice: gas, online shopping, dining, travel, drug stores, or home improvement/furnishing. Now earn 3% cash back in your choice category and 2% at grocery stores and wholesale clubs (up to $2,500 in combined choice category/grocery store/wholesale club quarterly purchases), and unlimited 1% on all other purchases. You can update your choice category for future purchases once each calendar month using the mobile banking app or online banking, or do nothing and it stays the same. Additionally, new cardholders will earn a $200 online cash rewards bonus after making $1,000 in purchases in the first 90 days of account opening. There's also a 0 percent introductory APR on purchases for the first 12 billing cycles (then, 16.24% - 26.24% Variable APR on purchases) and on balance transfers made within the first 60 days of account-opening (then, 16.24% - 26.24% Variable APR on balance transfers) with the Bank of America® Cash Rewards credit card (there is a 3 percent, minimum $10, fee on each transfer made). Similar to the other two cards compared above, the Bank of America® Cash Rewards credit card is a great cash-back card to consider, especially if bonuses are what's important to you as a cardholder; however, for those looking for a little more peace of mind when it comes to their purchases, the HSBC Platinum Mastercard® with Rewards credit card might be the better card to consider. And, once again, you'll pay foreign transaction fees with this card if you decide to use it while abroad. Who Should Get the HSBC Platinum Mastercard® with Rewards Credit Card? Thanks to HSBC's superb fraud protection and purchase assurance, price protection, travel assistance, and roadside assistance services, the HSBC Platinum Mastercard® with Rewards credit cardHSBC Platinum Mastercard® with Rewards credit card is a great no-annual-fee card option for those looking for some added purchase security and great shopping and travel protection perks. Plus, use it every day for every purchase and you'll see some rewards start to accumulate. The APR is ridiculous. They were not willing to work with me to lower it either.